140 Minutes Of The Night. Kiabab National Forest. 2hr 20min exposure. Spring 2011. Distant suns spatter our night sky as we circle our own at 67,000 miles per hour. But when time is slowed to a crawl, these balls of flaming gas rend the black of night to become whirling embers silhouetting the horizon with their colorful twinkling glow. Whew, that was a mouthful. But I was there and I felt the awesomeness of the place that is now recalled to my mind by this finished image. This towering old tree sits in the clearing, dwarfed by the vast sparkling night sky. It was beautiful. At just over 2 hours, this is my longest exposure to date. We were camping high in the hills near Grand Canyon NP, in an area known for its views of the night sky. We had actually set up in the open woods about a hundred yards from this tree, and I had been eying it for a couple days. There was just something majestic about its barren branches as it stood leafless but still proud. I decided on a night scene. I spent over an hour roaming around the tree from every angle, trying to see it in different ways as the sun set. I found best best angle and set up the gear in preparation for night. The result, after about two hours and twenty minutes of exposure, is this. Release details: Prints Available.. Order Open Edition originals above.. Master prints and Signature Limited Editions are listed below and can be ordered by contacting gallery.. Learn about Limited Edition values here. Canon 5D MK2, 24mm TS-e II, f8, ISO100, exposure 140min (approx). Want to learn more about light, processing and dynamic range. Join Gavin’s annual Lights & Shadows Workshop. I’m going to go into detail here. Like I said, I spent over an hour walking around the tree and testing angles, focus, and composition. I also tried various shift settings with my 24mm tilt shift lens to control perspective until I found the one that I felt the most natural, shifting just a bit up to reduce the distortion of the tree. I don’t believe I’ve spent so long planning a composition. It felt good. At a glance, I might have said there’s no way I could spend so long and still be improving it, but I would have been wrong. Taking the time on this was, in my opinion, one of the most important factors in this image. I finally decided on a spot, then spent a good deal more time refining the composition down to a gnat’s hiccup. I kept tweaking and focusing, then going to analyze it on the laptop in the camper to make sure I had not missed anything. The planning was exhilarating and purposeful. I would be shooting in the dark, and, for the first time, I planned to set up the camera exactly where it would be and leave it until the time came. This gave me more control than a last minute night composition using the high ISO technique I described in this post. I left the camera in the field and went back to the trailer and a campfire with my family. A few hours later, the sun was gone, and true night had set in. I already had an idea what exposure I would need from previous work, but did a few tests to verify that I wanted about 2 hours. I took a high ISO exposure, not for composition, but to verify length of exposure I would be using at my low ISO ( see this post). As I’ve mentioned in the past, ultra long frames tend to come out dark rather than light so I planned to add just a little more. I started the frame, locking into bulb using my cable release. Then I returned to the camper, and my alarm went off 2 hours and 15 minutes later. I went out, being very careful not to shine a flashlight near the scene or lens which would ruin my image in an instant. I had black frame noise reduction set to auto. You can learn more about it here if you are not familiar with it, but essentially it takes an equal length exposure with the lens blacked out to capture hot pixels on the sensor against black, allowing them to be mapped and removed. In this case, the camera did not do an auto dark frame. Probably the system thought it unnecessary because of the low ISO and because the camera seemed to lose track of how long the exposure was. It seems to stop counting at about 35 minutes. I guess Exif data is not designed to handle this length. After the exposure, I went into the camper for review. It looked good, and the regular ISO noise was not bad at all thanks to ISO100. The hot pixels, however, were bad, and LR could not take those out. That said, it could have been worse. It was cool outside and the higher the outside temperature, the more the sensor heats up and produces this type of artifacting. I immediately decided to make a dark frame manually. This is a common approach done by setting the camera in the same conditions and taking an equal length exposure with the lens cap on. It was late, so I set an alarm and set the camera outside starting the exposure and went to bed, bringing it in and stopping the exposure when the alarm expired. Whew, now for the process. If you’re still reading this, you get the gritty details. I started in LR with my presets, then went into the sliders, working the color, noise, and detail carefully to get everything as good as I could before going to Photoshop. This is actually an HDR, but manually blended. I took a frame of the final composition just as the sun set that still retained light in the trees. I had others, but this had a proper nighttime blue cast. After all this LR processing, I went into PS with the main image and soon after brought the twilight image. I very gently masked in the area around the trees, bringing in detail to prevent the foreground from being all black, but not so much as to become a distraction. The silhouetted tree is still my subject. This basic look achieved, I set to work trying to get rid of those pesky hot pixels that you can see in the example below. I started with basic black frame reduction. Bringing my dark frame of equal exposure into PS, I laid it over the image, then set its blending mode to difference. The goal here is to take the spots of the image and effectively subtract them with the ones mapped on the black frame. I tweaked with the opacity to avoid them appearing as darker dots, and that was the process. It worked. But not enough. I continued to use variations of the black frame with different settings, using the same approach but hoping to target pixels differently. It’s normal to use multiple layers when doing this manually, and, again, this helped, but I was not home free; I wanted a large wall print of this. I may have been better off to make two or three dark frames to get slightly differing, hot pixel patterns, though that would have taken most the night. After this, I then used Topaz De Noise on a copied layer of the main image. Even though this is not normal noise, it did help out. But to avoid killing the detail I could not apply the Topaz too heavily. I was getting closer, but there were still dots. After hours of working with this image, researching alternate ideas, and trying in various ways to destroy the dots, I was closer but not as close as I wanted. I won’t go into all my tests, but using everything I described above, I finally added a merged copy of the main image layer group with all the previous corrections combined into it. I used the despeckle tool in PS, and this helped out a lot but left me with a huge loss of detail. To compensate, I made a copy of the layer and boosted up its contrast with curves and levels to the point at which it was way overdone and had ultra hard edges. Then, I did a select all on the contrasted layer (cmd +a), copied it, and turned it off. I added a mask to the despecked layer, and, instead of mask painting with a brush, I Opt (Alt) clicked the mask icon to bring it into mask view mode. Then I posted the actual contrasted image over it as a mask (cmd + v) which made a grayscale mask that matched the contrasted image. This masked away hard edges and detail on the despecked image, revealing the more detailed layers below. I know this is getting complicated, but I wanted to outline what I did here for you and for myself. That about did it. I had finally gotten rid of most of the dots and still had good detail. At that point, I saved back into LR, did some final tweaks on things like saturation to refine the look and did some healing brush work on very hot and off-colored pixels that has not been removed. I’ll post a copy of the final vs the initial LR process below, so you can see how bad the hot pixels were. Bear in mind, the final includes all my detail work including the HDR layering I did. Pre final version. Click for larger view. Note the tiny white dots all over the image. This entry was posted in color, f164, Fine Art, journal, nature, signature, technique and tagged f164, forest, grand canyon, hdr, night, sky, star, trails, tree. Bookmark the permalink. 13 Responses to 140 Minutes of the Night. Great shot. I love the subtle detail in the trees that you brought out by the “HDR” blending. That is crazy! I could not imagine spending that much time on one image! Some things I guess film was better for. I had no idea that a night shot could be that complicated! Awesome shot though. Well worth it for a good wall portrait! Great shot, Gav! Will have to try it one night! I think, with all the hot pixels taking so much of your editing time, I’d just shot this with film and scan into digital. Then use your digital shots to blend manually into an HDR where needed. However, I do love your final result here. Great work Gavin. Tell me – was it intentional to get the centre of rotation of the sky just out of shot? How did you know where it was going to be? wow!so good!so crazy doing those things to get the photo.Stunning! Excellent image. Thank you very much for the detailed explanation. May have to give this a go myself one day. Congratulations on the fruit of all that labour Gav. Totally awesome. Guess I’ll have to take some film out of the freezer. Thanks everyone. It was quite a project. Defiantly has me thinking about things for the future. I have plans to try longer ones, though I think film might be in order for much more than this. I’ll get reciprocity, but no sensor noise. Andrew I confess I did not know what the sky would do. I did plan the setup and composition very very carefully, but the way direction of the movement was an added bonus. That must have been fun. 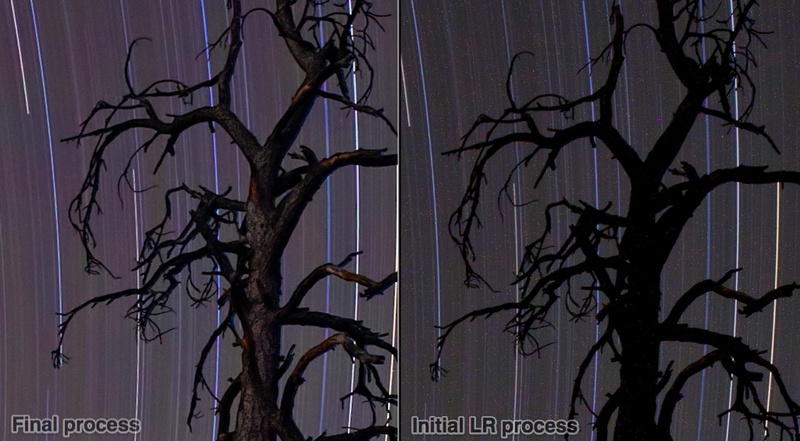 Ever think about consecutive exposures to get short short star trails on each frame then stitch them together? Why not f16 or higher? Good stuff, thanks for posting! Hey Matt. Ya I’ve looked at those a bit. 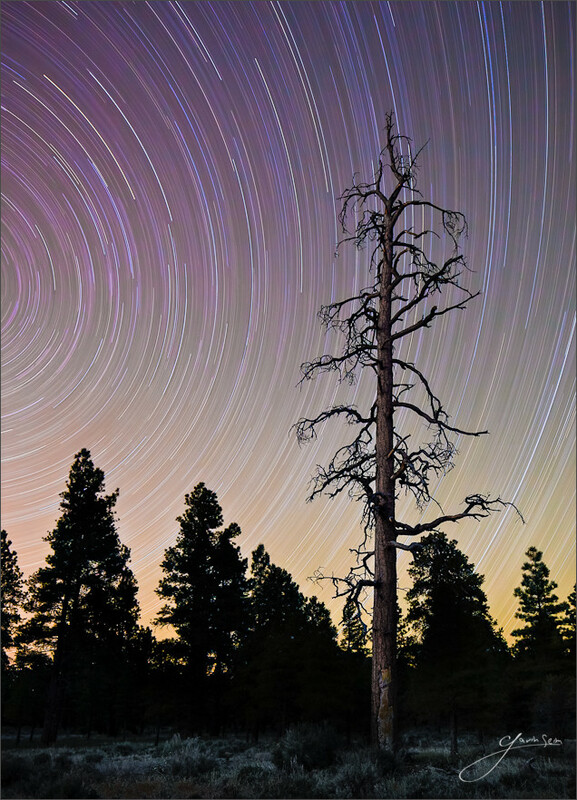 My preference is the challenge of a single star trail but there’s some beautiful incremental ones out there. What an amazing photo! This is truely wonderful, it just goes to show in what a beautiful world we live in, thank goodness to the photographers that capture these moments in time!